It’s been an organising and tidying day today, prompted somewhat by visiting relatives. It feels lovely to have the house all neat and organised. As it’s been that kind of day I thought I’d share my wonderfully useful storage solution for old craft magazines. My solution involves an old Buddy Box and strips of card. Trawling through the magazines I pulled out interesting projects, articles and pretty papers. Putting the pretty paper to one side I set the remaining sections into categories and folded them down to fit. I then wrote up labels on strips of cardboard and separated the pages into sections. What took up half bookshelf now fits into a very reasonably sized box. Theo very much appreciated the new raised bed on his favourite chair. When my therapist gave me this piece of advise I told her she was wrong. I absolutely hate doing anything that I deem less than perfect. This way of thinking is not helpful, it often leads to not doing anything for fear of doing it badly. This perfectionism is ever present in my life. I have only recently been able to consider the idea that even if I feel I’ve done something poorly, it does not mean that I am a failure. Recently I’ve been able to do a lot more, however this is not as good as it may appear. I have gone from doing very little to filling my day and exhausting myself. I now start to feel I have to work endlessly in order to prove I am a worthwhile person. My solution to this was scheduling and alarms set on my phone. 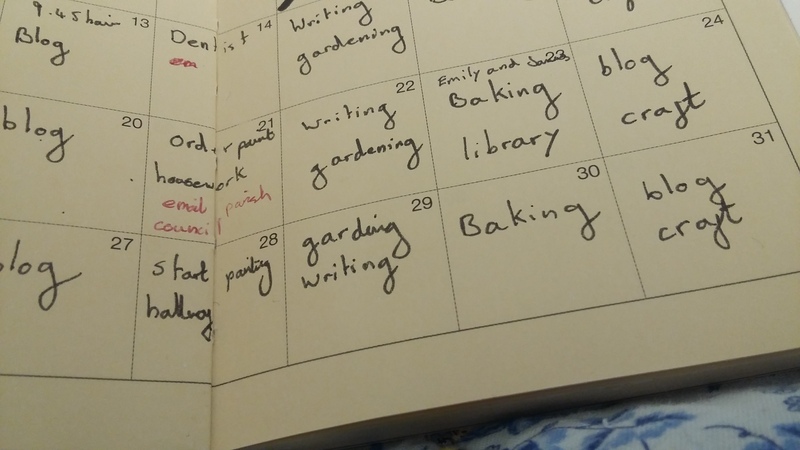 I wrote a list of things I would like to do this month and divided it into weeks and then planned one or two activities to do each day. With set activities each day I hope I can concentrate more on doing what I enjoy without the the stress of trying to do too much. I am starting to believe that if a job is worth doing it’s worth doing badly….so long as it gets done.